ShockDrain is an engineered pad manufactured in the U.S. using Thermoplastic Elastomers Polyolefin Composites (TEPC). The pad itself is 100% recyclable from one cradle to another and meets the most stringent regulatory requirements. ShockDrain 580 is a shock attenuation and synthetic aggregate technology designed for the use beneath synthetic turf to achieve optimum athlete performance. The pad is unique and is also used in “new generation” Sports Fields for field foundations and water conservation. 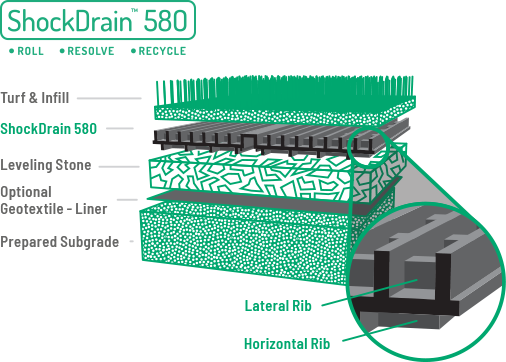 Why ShockDrain 580?